Preface: A grassroots campaign began in the spring of 2009 to obtain a nomination for Barb Maroney into the Cadets Hall of Fame. Spearheaded by Sam Signorelli, a letter writing initiative was undertaken, culminating into Barb's nomination into the Hall of Fame in May 2009 (click here). For reference purposes, here's the original interview for the first issue of The Middle Horn Leader with Barb Maroney. Originally published March 31, 1992. 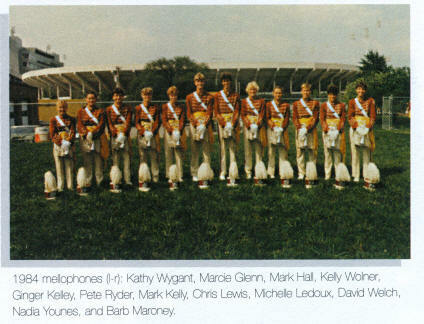 Barbara Maroney is probably best known for her mellophone solo work with the World Champion Garfield Cadets during their '83 and '84 shows. Barbara started her tenure with the activity at the age of seven, playing soprano for a small corps in DuMont, New Jersey called the Sundowners. 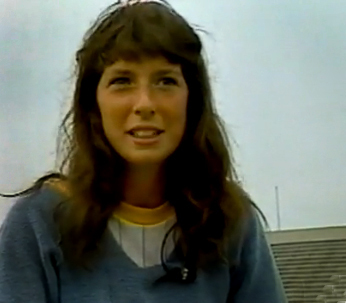 She took a hiatus from the activity during her high school years, joining the Garfield Cadets in '81 and aging out in '84. 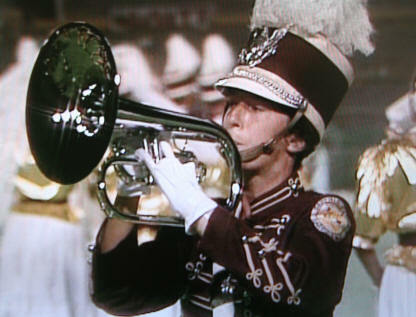 Since aging out, she's become a very respected teacher, instructing numerous brass lines, even serving as brass caption-head for The Spirit of Atlanta in 1990. Currently, Barbara is living in Marietta, Georgia, teaching high school and working with the Denver Blue Knights Drum and Bugle Corps. I interviewed Barbara by telephone on March 24, 1992. Scooter Pirtle: Barbara, your solo work in '83 and '84 is, at this point, beyond legendary. The work you did is unbelievable. I can't imagine anyone even writing that kind of stuff, much less pulling it off in a finals situation. Were you nervous? Barbara Maroney: Oh, I was terrified in 1983. In 1984, I was very fortunate. I was real fortunate, I think, to march where I marched, when I marched, because of the people around the corps, and because those were the evolutionary years. It was a good thing to be a part of, it's made me a much stronger person. When I think about what I experienced and what I felt and how I've learned and grown as a person, my hope is to give other people that same situation or that same opportunity. So, now when I teach, that's always in the back of my mind, and I'm always trying to somehow prepare the opportunity for them. You can't give it to them, they have to get it themselves, but I think you can set up a situation where they're able to get it. SP: In that show in '84, you had an incredibly taxing solo at the tail end of what was, at that time, the most physically demanding show in history. I listen to the CDs and I know you didn't take any breaks. I look at the tapes and you're not even breathing heavy. Is it the physical endurance that lets you get through that type of show, or is there more of a mental aspect to it? BM: I think it's both. You have to give yourself the physical ability to be able to do it. When I'm teaching now, if they technically can't play or perform what I'm asking them to do, they're not going to be able to relax and play it musically. So, I think that's the foundation of it. And as for the mental thing...[pause]...At that time in my life, that was everything I was. How I performed or what came out of my horn was really me. I mean, it was everything I had to offer at that time in my life. I remember George Zingali. He taught me a lot of things. One of the things is that you can always tell when what you do is a part of you and means something, or if there's a reason behind it. I guess just being in the atmosphere that I was in, there was a reason behind it for me. What [the reason] was, I'm not real sure. SP: Well, it was. That's for sure. BM: There was something there. SP: OK, a couple of technical questions. 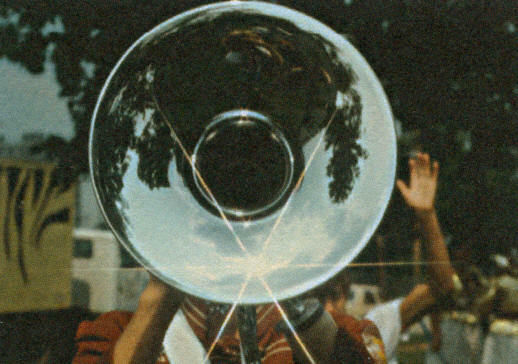 The "high C" above the staff is a very unforgiving proposition on a chrome-plated mellophone. Yours were so warm and open. How did you approach the "high C"? BM: Well, I didn't approach it like it was a "high C," I just approached it like it was a part of the thought behind the music. I find, with the people I work with, that if they think of the pitch as being high, loud, or low, they won't get it. But if they put it in context of "it's a pitch, it's just a sound," there's nothing more difficult about "it" than other things. SP: So, you've just got to get past the mechanics completely. BM: Yes, I thinks that's really what you need to do. SP: I know that you've studied both trumpet and horn. When you play the mellophone, which I think is the most unique instrument in the world, do you try to play it like a trumpet, a French horn, or is it somewhere in between? BM: it's definitely a mid-range instrument. It's definitely the French horn. 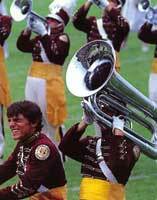 I would love to use the French horns on the field, but they are very unforgiving, and the mellophone is the best replacement for it. Even when you're writing for the instrument, you need to write for it as a mid-ranged instrument, as the filler. You know, it's like the icing on the cake. SP: Yeah, that's how Jim Prime approaches it. He has fun writing the mellophone parts. That's his vehicle, you know. It's like it's his "cause" or something. OK, here's a sexist question for you, but I've got to ask it. Why do girls make better mellophone players than guys? Do you guys know something we don't? BM: Are you talking about the age-range for a junior corps? BM: Boy, I'm going to get killed for this one. I think, at that age, girls are more able to express their emotions. SP: Wow, I've never even thought about it that way. BM: I mean, that's the age when they start thinking about themselves and how they look, and that's when they say "Oh, isn't that cat pretty" or "look at the babies" and all of that stuff. The guys are not really there yet. I can even tell in the line, 17 year old girls and the older guys, are about the same level in that kind of thing. For the most part, you get girls in the mellophone line.. Although, I've had some really great guys playing mellophone. The soloist at Garfield was a guy soloist, he was wonderful. SP: What year was that? BM: That was the "Les Mis" year. SP: Oh yeah. Was that a guy soloist last year, who did the "letter from home" solo? BM: No, that was a girl. SP: OK. That was incredible, too. They haven't written them that tough since you were there. A "high C" articulation. Give me a break! BM: Yeah, and not a lot of people appreciated it, or knew it. SP: Well, I did. I couldn't believe it. You've instructed a lot of corps. What's the single biggest weakness you see in brass players today? BM: I think confidence and just playing out. Giving me something to work with, that's always the first struggle. That's pretty universal, and that's one thing that I've learned from dealing with people in different places and countries. It's pretty universal. You know, kids are pretty much the same everywhere. Barbara Maroney demonstrating why it's hard to become a recognized mellophonist. SP: What bit of sage advice would you give to a mid-voice player today, looking back on your vast experience? We are unique people, you know. You look at the sopranos and they're the hot shots, the 1sts don't talk to the 3rds. You look at the baritones and they have to be intelligent and quiet. The contras have a five-word vocabulary. But the mid-voice, we're kind of like the "human debris." We're kids that want to go play soprano, but don't have high enough range, but we've got a good tone. So, they throw us into the mellophone line. We're the French horn people who are thoroughly confused about the whole situation. What do you tell these people? Any advice? BM: Well, you brought up a good point. Being the soprano player without the range and the confused French horn player, they need to feel like they are an important part, and they are. Otherwise, they wouldn't be there. Otherwise, the line itself wouldn't be written in the music and all that kind of stuff. They need to come together and form a group or a bond real quickly. Once they do that, they seem to be the tightest and strongest section. SP: I agree. You take a completely mental approach to it, don't you? BM: I think everything I do really comes from more of an emotional standpoint. So, yeah, it's mental in that regard. But, if you don't have that, you don't have anything. SP: OK. One more question and I'll let you go. You stole my heart at a show in Evansville in '83. I've been transfixed ever since. So, I'm going to hate myself if I don't ask you this. Barbara Maroney, will you marry me? BM: (Laughs) I don't know. I never really thought about getting married. 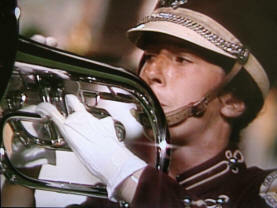 SP: Now that's a typical mellophone response. Alright, will you at least consider becoming an honorary member of our section? You'll get a free member T-shirt with your name on the back. BM: That would be great! SP: This has been great. It's kinda like a weird dream or something. Thank you for the interview.